The next day cream the starter with the water and blueberry puree for the recipe, then add in the oil. Lightly dust your counter or work space with flour and scrape the dough out. With lightly floured hands, give the dough a stretch and fold and then flatten it out into a rectangle. Spread as much of the blueberries and hazelnuts as possible over the top of the dough, then give it a fold or two to incorporate them. Once those are incorporated, work the dough a bit more if needed and add the rest of the blueberries and hazelnuts. 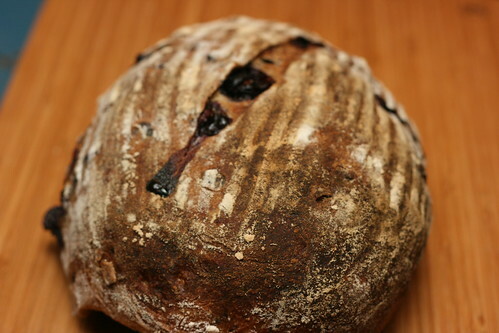 The smell of this bread as it was rising was so powerfully blueberry that it was amazing. 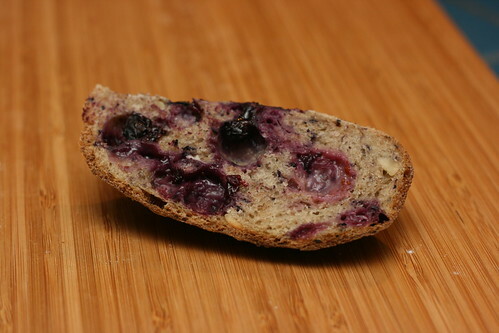 The extra blueberry puree added some nice color to the dough as well, especially all the little flecks of skin. I think I might even be able to push the puree content a bit more, as pureed blueberries seemed to be just barely thicker than water. I’ve never really enjoyed blueberry pie, and now I know why! I was waiting for blueberry bread! 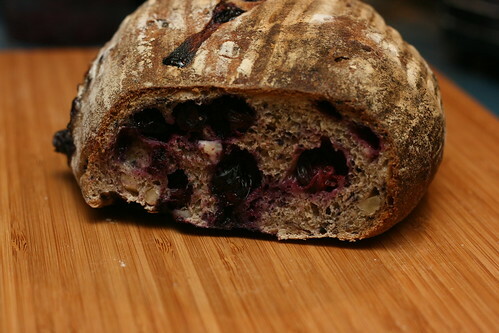 The blueberries are really easy to mix into the dough as long as you don’t handle it especially vigorously, they stay whole and and no moisture. During the baking, any that are near the surface will probably boil and burst (when I took the loaf out of the oven it appeared to be crying ‘blueberry tears’). Don’t worry though, these are tears of joy. 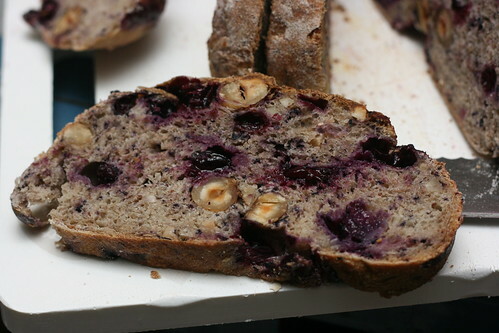 Well, like I said, I had more fruit and nut breads up my sleeves, so, submitting this one to YeastSpotting this week. This one was so good, that it was rather sad I only got to have a little bit of it before I got sick a few weeks ago, all the more reason to make it again! delicieux. oh, blueberries, I can’t wait for you to arrive! Wow. What a pretty loaf. I bet it tasted great with butter.